I've forgotten where this info and image came from. Sorry! Edited by yours truly (contact me). Saint Seiya is a story from Masami Kurumada about warriors called 'Saints' whose task is to protect, and to fight against evil forces. There are also evil Saints in the story who are on the hostile side. It is said that every 200 years an evil will come back to Earth and try to rule the world, and at the same time, the Goddess Athena will be reincarnated to prevent the evil from accesion to power on Earth. 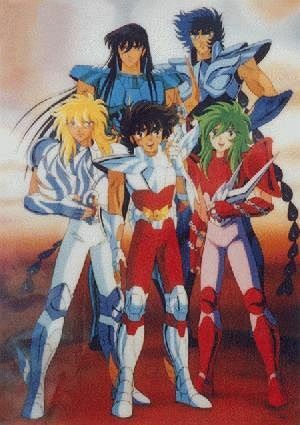 The story has five main chacters: Seiya the Pegasus Saint, Shiryu the Dragon Saint, Shun the Andromeda Saint, Hyoga the Cygnus Saint, and Ikki the Phoenix Saint. The task of these Saints is to protect Athena, the Goddess of peace, and to defeat the evil forces. The Saints wear special armour, which each has deserved after years of hard training. Their armour not only protects them from external impacts, but also gives them special abilities. The armour represents a star constellation, from which a Saint also gains his power, called 'cosmo'. The cosmo of a Saint is like an aura. According to the story, everyone has a cosmo, which he/she is able to discover. Saint Seiya brings the subjects of "friendship" and "holding together" to you in an amazing way. The feature also demonstrates that the "bad guys" can have their good sides, and needn't be only mad, dumb, and ugly. The enemies are not just there acting as "cannon-fodder", but they are fighting for an ideal they believe in, thus they have a reason to be. This makes them just as interesting and enoyable as the main characters. Saint Seiya has now been released in America by DiC, in two versions: a version of the series edited for television under the name "Knights of the Zodiac" (this is incidentally the title of the series as seen in Europe under various languages), and an uncut version released only on video (though A.D. Vision) which retains the original "Saint Seiya" title. The above description came from Saint Seiya International - An Introduction, and was edited by yours truly (contact me).